Grab your pencil, Dragon Master! AdventureQuest DRAGONS, the brand-new idle game for iOS and Android, is a critical hit! Since its launch in December, over 100 shining Reviews gave DRAGONS a 4.5 Star Rating in the App Store, and over 5000 Reviews gave it 4 Stars on Google Play! We know you love DRAGONS. We also know you love Fan Art Contests. And we know you loveloveLOVE getting free stuff. 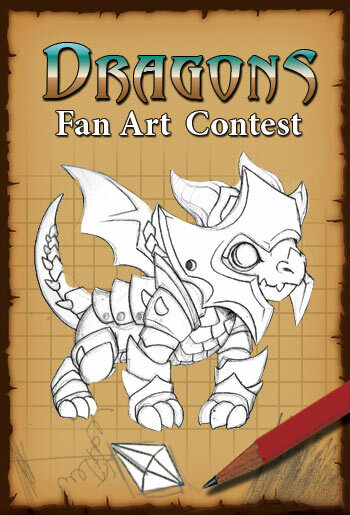 So we all know what that means: it’s time for our first-ever AdventureQuest DRAGONS Fan Art Contest! Since this contest is all about AdventureQuest DRAGONS, you’ll need to download and play DRAGONS (if you haven’t already) so you have references for your Fan Art creation! This contest is OPEN to any player of every Artix Entertainment game, but the Contest Prizes will only be awarded inside AdventureQuest Worlds. We are unable to award prizes inside Mobile Games (sorry! ), so it isimportant to have DRAGONS installed on your smartphone and/or tablet AND have an active AdventureQuest Worlds account in case your Fan Art submission wins! As always, we reserve the right to award additional prizes for those who go above and beyond! This is the most important part of the whole contest. Read all the rules below BEFORE entering your DRAGONS Fan Art submission. Follow EACH rule if you want your entry to be considered eligible. 1. Create AdventureQuest DRAGONS Fan Art! You can Draw, Paint, Flash, Photoshop, 3D Print, Sculpt, Bake/Decorate, Comic-strip, Cosplay, or create a Stuffed Animal/Plushie of anything relating to AQ DRAGONS. Get creative here, folks! IMPORTANT: Do NOT submit random drawings of random dragons. This contest is ONLY wanting fan art of the Dragons found within the mobile game, AdventureQuest DRAGONS. 2. Your AQ DRAGONS Fan Art MUST BE created by YOU. And only YOU. No teaming up with friends, sorry. 3. DO NOT trace or steal ANY artwork! If your fan art is stolen from any Artix game, or traced overpreexisting DRAGONS art work, or directly copied from another dragon-related photo online, YOU WILL BE disqualified. 4. Your AQ DRAGONS Fan Art entry MUST include your AQW Character Name somewhere on the picture. No name = no chance at winning, and the possibility of someone else stealing your hard work. Pleasewrite/sign your AQW Character Name legibly so we can actually read it =) Also: DO NOT CHANGE your AQW Character name during the contest and contest judging! 5. Put the date on your entry so no one tries to steal your Fan Art during future contests (because you know some sneaky scoundrel will try)! 6. Type your AQWorlds Character Name in your Tweet BEFORE submitting. That way, if you win, I can easily copy your Character Name for faster prize awarding and no mistakes. 7. Include hashtag #DRAGONS in your Tweet so that way the whole world can see your awesome art, too! Check off each item below before submitting your entry to ensure your chance at winning! And there you have it, folks! Best of luck to you, and if you need some AQ DRAGONS inspiration, check out theAQ DRAGONS Facebook Page here for some awesome DRAGONS artwork. Everyone here at Artix Entertainment is super excited to see what AdventureQuest DRAGONS Fan Art you come up with! Best of luck to you, and don’t forget to have fun and Battle ON!